Last week was finally the week we saw Gracie’s Integrative Paedritician Dr Leila Masson. We had a big gap between her last appointment as she had to relocate back overseas, but she’s returned to Australia for a few weeks to see patients and to be a speaker at the International MINDD conference for practitioners. As I mentioned in previous posts, the past several weeks have been tough with Gracie’s chronic constipation getting to the point where it was very hard to manage (and very stressful). We pinpointed the change in her gut from a bad 24 hour Gastro bug she had which seems to have completely upset her system. What I love about seeing an Integrative Doctor is the difference in how they look and treat their patients. Dr Masson examined Gracie feeling her tummy, checking her skin, nails etc and the outcome of these examinations build up a picture and part of her treatment plan. Because of the current blip and her severe constipation we have had to swap Gracie over to a stronger laxative (not happy! ), so the plan is to increase her supplements a bit more and to try and work on weaning her back down on the laxative. Dr Masson also recommended Gracie have a Faecal Microbial Analysis test (FMA), which is done via a stool sample and looks at the microflora of your intestinal tract – it is different to the standard stool tests you have done at your local GP. The lab culture, identify and quantify faecal bacteria, including aerobes, anaerobes, and yeasts. Luckily I had only recently done a FMA test myself for my own health issues and Dr Masson was happy to use my results as a guide in treating Gracie (a child’s gut flora is similar to their mother’s), so we are now sharing a Probiotic called ‘Mutaflor’ for different reasons. Mutaflor is meant to be a very effective probiotic for treating chronic constipation. However, if we don’t see any improvement after three months we are to going to get Gracie’s own FMA test done to see if it sheds any further light into what’s going on within her gut. As we were discussing Gracie, Dr Masson made a really good point that Gracie is most likely picking up on all my nervous tension around her situation and that I basically need to back off a bit (which I find hard to do!). All the way home I was thinking about it and realise how very uptight I’ve become about this whole situation and that I do need to try and back off as Grace is of the age that she understands and is picking up on everything and I definitely don’t want to do anything that is going to impede her. When I look back I realise that we have come a super long way in our journey. We’ve managed to completely clear up her eczema, which has never reappeared and also managed to reintroduce some foods that now don’t seem to be an issue. Sometimes you get so caught up with the daily things you don’t realise just how far you have come. If anyone is interested Dr Leila Masson has written a wonderful book called ‘Children’s Health A to Z for New Zealand Parents‘ it’s not just for New Zealand parents, it’s for any parent who is interested in a natural approach to common ailments. I have purchased it and its such a handy book! Casey-Lee is a qualified Nutritionist, Naturopath and mother to another little Gracie, based in Brisbane, Australia. I just love her outlook to food and we adore her delicious recipes. All Casey-Lee’s recipes are Gluten, Dairy and refined sugar-free which makes them a fantastic resource for families who have food allergies and/or intolerances and are looking to transition to a more wholesome way of eating. I recently caught up with Casey-Lee to find out more about herself and Live Love Nourish. How has becoming a mother affected your outlook on food? As a Nutritionist and Naturopath my outlook on food has always been of an understanding and respect for how much food can impact our health and the way we feel on a daily basis. Now as a mum I have an even greater respect (and real experience) for the influence food has on our children’s development, behaviour and ability to thrive. Becoming a mother has also made me become much more time-efficient in the kitchen with a great appreciation for making recipes that are not only kid-friendly but time-friendly too as well as embracing a messy kitchen! What lead you to become a qualified nutritionist and naturopath? Growing up I always had an interest in natural health and was lucky enough to be surrounded by a family interested in healthy living also. Becoming qualified meant I could share my passion for helping others to live a healthier and happier life. Why are all your recipes Gluten, Dairy and refined-sugar free? I really believe in the benefits of eating a whole-foods diet (avoiding processed and packaged food as much as possible). When you stick to fresh and whole food you naturally eliminate the processed sources of gluten, dairy and sugar and instead begin to cook with real food ingredients that love your body back. As I teach in my 8 week online program, I also believe in tuning in to your body to find a diet that best works for you and your body’s unique needs. For me that means cutting out gluten, dairy and refined sugar. My recipes are all 100% free from gluten, dairy and refined sugar catering for anyone looking to embrace a whole-foods way of eating as well as to support anyone with food sensitivities and special dietary requirements. Can you tell us a bit about Live Love Nourish and the philosophy behind it? Live Love Nourish is an online health website that specialises in sharing healthy, simple and real food recipes (all free from gluten, dairy and refined sugar) as well as practical nutrition and lifestyle advice and the Live Love Nourish signature 8 week program. I believe health requires a holistic approach and we feel our best when we live true to ourselves, have love for ourself and others and nourish our body. Hence, the philosophy behind LLN is to “live the real you, love truly and deeply and nourish from the inside out”. This changes week-to- week! At the moment, I’m loving my healthy version of “fish and chips;” crispy skin salmon with homemade sweet potato chips seasoned with spices and served with an avocado dipping sauce. My toddler Gracie loves this too. What advice would you give to families navigating special dietary requirements? Keep it simple. Use simple ingredients. Be kind on yourself. Allow a little extra time and space at first. Seek support where you can. If you are looking for help with what to stock in a healthy, gluten, dairy and sugar free kitchen, the Live Love Nourish Pantry Detox e-book is currently on sale for AU$5. The e-book includes an extensive list of ingredients to stock, healthy swaps and alternatives and money-saving tips. As a friend of Healing Gracie’s Gut receive a $50 discount off The Live Love Nourish 8 Week Online Program using the code NOURISH at the checkout. The program is an online guide to help you live a healthier and happier life and includes 8 weeks of meal plans all done for you, (all free from gluten, dairy and sugar) shoppings lists, nutritional guides and support to develop a healthy relationship with food. After hearing how much Gracie loved the Live Love Nourish ‘free from’ banana bread Casey-Lee is kindly sharing this amazing recipe. The Live Love Nourish Banana Bread is free from gluten, dairy, nuts, soy, eggs and sugar! In a medium mixing bowl combine buckwheat, coconut, baking powder and vanilla. Add banana and coconut oil mixture and combine well. Julia Simmonds is a mother to the gorgeous Christian and Sofia, a registered pharmacist and founder of Itchy Baby Co. Itchy Baby Co produce natural products for parents of children who suffer from eczema and sensitive skin. I recently interviewed Julia to find out more about herself and her fantastic products. Fun question to start with! What did you have for breakfast this morning? This morning, like every morning, I felt my way to my coffee machine and drew a very long black. Made the kids breakfast and then blended a spinach, banana, ginger, cinnamon and oat smoothie. I really like this for breakfast because I can sip it on the go. Why did you create Itchy Baby Co? Itchy baby co. was born from a really dark place. I was struggling to manage my little boy Christian’s eczema and desperate to try anything which would give him some relief physically and me some relief emotionally. Finally I stumbled across the wonder of colloidal oatmeal and it grew from there. What was the turning point in your son’s recovery? I would love to say it was only using natural itchy baby co. products and the sticking to our bathtime and moisturising routine every day, and no doubt this has been a huge part of it. Other changes I have made is trying to keep what we eat and any products used in our home as natural, organic, unprocessed and chemical free as possible. What’s your opinion on the link between food allergies/intolerances and eczema? With eczema we are always looking for something which can bring our little ones relief, and eliminating certain foods from your child’s diet is really tempting. In some children with severe eczema taking away certain foods from their diet can help manage their eczema. It’s important to remember that foods can be a trigger for eczema but eating a particular food does not cause eczema. So, taking away a food from your child’s diet might improve their skin, but will not cure their eczema. What’s your advice to parents whose children have eczema? Stay strong. You are doing the best you can. Not everything you do will get results and often it’s a combination of different things you try which can help your child. Moisturising, moisturising, bath time and then more moisturising. In between that I spend time connecting with parents who are living with the challenge of managing their child’s eczema by email, facebook, insta and writing my blog. On really special days I’m testing new itchy baby co. products on my Christian and Sofia and many of their friends. How do you try and keep a healthy, balanced life? Mentally I always try to look ahead and keep focused on my mission to help young families struggling with eczema. Physically I keep an exercise mat in my home office and try to make regular contact with it. Emotionally I cuddle my children as often as they’ll let me. I would like to give a very warm welcome to the lovely Georgia Harding from Well Nourished. Georgia is a Naturopath with over 20 years experience living in sunny Queensland with her two lovely children and husband. As a background, I stumbled across Georgia, via her Well Nourished Lunchbox Facebook group (which has amassed a huge following!) 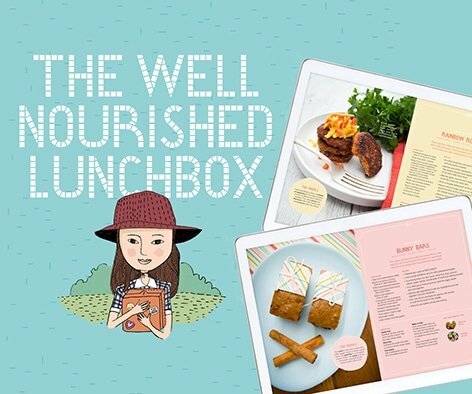 and swiftly purchased her Well Nourished Lunchbox e-book which has now become a firm favourite in our household. Fun question to start with! What was the last book you read? Con Iggulden Conqueror Series – a series of five books that basically tell the life story of Genghis Khan, they were brilliant. The most fascinating part for me is learning how the Mongols survived trekking the harshest climate consuming mostly milk (from their horses and goats), dried meat and root vegetables (while they lasted) and when desperate, they nicked an artery and drank the blood of their mares. Even the heaviest reads come back to food for me – ha ha! What was your inspiration for starting Well Nourished? Definitely my kids. I really wanted to help families to feed their kids well. The predictions for the long term health and wellbeing of this generation is pretty dire. Starting my website was my way of sharing my experience as a Naturopath and my passion for making whole foods utterly delicious to make a difference. How have your own health problems shaped the way you eat? I’ve always eaten pretty well, I was very lucky to be raised by a very health conscious mum. I’ve been seriously ill twice in my lifetime and I suppose this has actually forced me to look beyond food to heal. On both occasions stress, unresolved grief and pushing myself beyond reasonable limits contributed a lot to my health decline. Eating well comes very naturally, I love cooking – but managing my stress, putting myself first occasionally is a work in progress! Has your philosophy on food changed since having children? I suppose I’ve been forced to loosen up a bit. I found with my first child I was very strict around food which was okay when she was little but when she began school and socialising with other kids I had to back of a lot in order for her to develop a healthy relationship with food. Kids are human, it’s normal for them to want what others have so I feed my family very well when I’m in charge, but at parties and sleep overs, they make their own choices (with my guidance and ongoing food education of course). When they don’t make good choices, we talk about how they feel and now my daughter is 12 (and has gorged herself on junk plenty of times) she is now very aware of how food makes her feel and I’m so proud of how she is able to make very healthy choices these days. Paves the way for her being able to self regulate as an adult. What top 3 tips would you give to families looking to transition to a more wholesome way of eating? Start slowly, choose one meal or food group and focus on that. Fill your pantry and fridge with mostly whole foods so there is less temptation to choose processed meals and snacks. Get them involved, ask for their feedback and support. Encourage them to help you when shopping and cooking – kids who feel they have had some involvement in their meal are way more likely to eat it. What advice would you give to parents whose children have food intolerances/allergies but are going through a fussy eating stage? All kids will go through a fussy stage at some point. It’s important to never give in to it and substitute a healthy whole food with nutritionally void food (because ‘something is better than nothing’). I understand that it is tough, but in my experience preventing food fussiness is easier than reversing it and if you give in once, your kids learn that they choose (where as you choose what and when, they choose how much). I have a whole library of information and strategies written on this topic which I’m hoping to release this year. What’s your go-to family meal? We eat such a varied diet – the upside of having a compulsively creative cook in charge!! If I’m feeling lazy though it will be some kind of simply cooked protein and a big salad. What exciting things have you got lined up in 2017? My website is in the process of being rebranded and rebuilt. I’m also developing an online library (of mostly podcasts) to help busy parents to raise food loving kids (and banish food fussiness). I’ve teamed up with a fabulous psychotherapist to share this fabulous info with loads of actionable strategies to really get kids eating and loving whole foods like my own do. Also a small pictorial cookbook of easy, whole food recipes that even little kids can cook from. Busy year!! Take 10% off ‘The Well Nourished Lunchbox’ eBook until the end of February with the code ‘NEWYEAR’ at checkout (normally $24.95). Please note as an affiliate of Well Nourished I will receive a small commission from the sale of each e-book that is made via my website. This helps to cover some of the running costs with maintaining my blog and also go towards some of Gracie’s medical expenses.